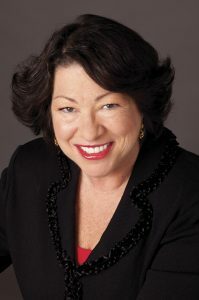 U.S. Supreme Court Justice Sonia Sotomayor will deliver remarks at the Golden Kite Awards Gala on Friday, February 8, 2019 with a talk entitled How I Became a Reader. Justice Sotomayor is the author of two books for young readers: Turning Pages: My Life Story (Philomel) and The Beloved World of Sonia Sotomayor (Delacorte). Each attendee at the Golden Kite Gala will receive a signed copy of one of Justice Sotomayor’s books. The Golden Kite Gala kicks off the annual Winter Conference in New York City. The Gala will present the Golden Kite Awards and the Sid Fleischman Humor Award to this year’s deserving winners. All Winter Conference participants are welcome to attend. For those who can’t attend the conference, interviews with the winners will be live-streamed from the “Golden Carpet” before the awards presentation and a highlights video will be posted to SCBWI social media after the Winter Conference concludes. Presented annually, the Golden Kite Awards and the Sid Fleischman Humor Award are the only children’s literary awards judged by a jury of peers. Over 1,000 books are entered in the Golden Kites each year seeking recognition in five categories: Young Reader & Middle Grade Fiction, Young Adult Fiction, Nonfiction, Picture Book Text, and Picture Book Illustration. The Sid Fleischman Humor Award, which is presented each year along with the Golden Kites, recognizes authors whose work exemplifies the excellent writing in the genre of humor.